The Union Missionary Baptist Church sits on Houston Street in historic Jefferson, the location of a church since 1842. The first structure was erected on the site in 1847 and the formal congregation of the Union Missionary Baptist Church was established in 1868. The Houston Street property was subject to violence and turmoil as part of the local backlash from the reconstruction policies and socio-economic upheaval at the close of the American Civil War. The church was the epicenter of black religious and political activities in Marion County during the Reconstruction. Its story chronicles the deep and often violent racial divide in East Texas after the Civil War. The construction of the current church building was not undertaken until 1883 when one of Jefferson’s prominent citizens stepped forward to assist the congregation. The building features a main sanctuary with a bell tower with a few smaller meeting rooms behind it. Separate from the building is an outdoor sunken brick baptismal. The 1883 church building continues to serve as a symbol of the Marion County African-American community identity. 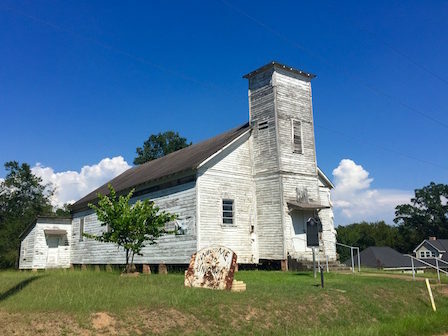 Over the years, the church building has fallen into disrepair as the congregation dwindled. A nonprofit organization consisting of congregation and community members has been hard at work, holding community meetings and fundraisers, and developing a roadmap for the restoration of the property. The building has been stabilized but much more needs to be accomplished in order to extend the building’s life and restore the landmark to tell its powerful story. UPDATE: The church was purchased in 2015 by the Today Foundation, which is working with Partners for Sacred Places to rehabilitate it as a cultural heritage center and event venue.